Over the past few months, fellow Arch_Kiosker, Grisha, and I, have been working on a fun project. 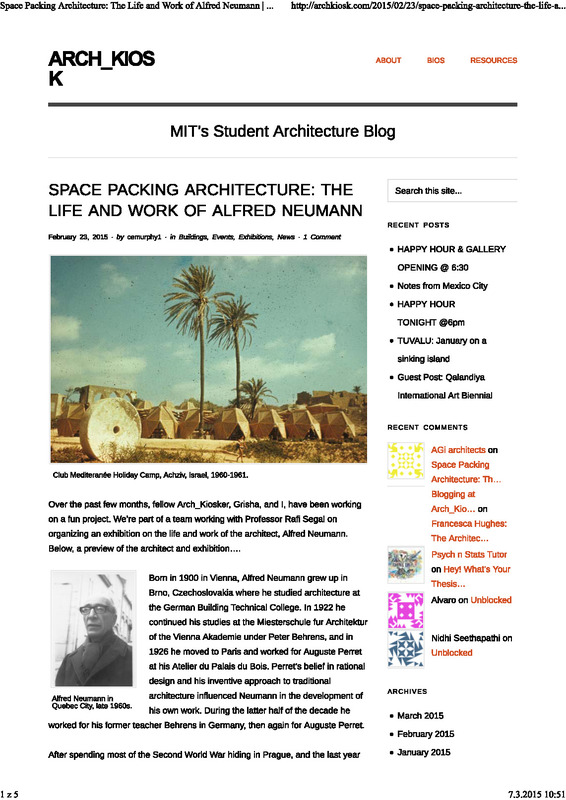 We’re part of a team working with Professor Rafi Segal on organizing an exhibition on the life and work of the architect, Alfred Neumann. Below, a preview of the architect and exhibition…. Born in 1900 in Vienna, Alfred Neumann grew up in Brno, Czechoslovakia where he studied architecture at the German Building Technical College. In 1922 he continued his studies at the Miesterschule fur Architektur of the Vienna Akademie under Peter Behrens, and in 1926 he moved to Paris and worked for Auguste Perret at his Atelier du Palais du Bois. Perret’s belief in rational design and his inventive approach to traditional architecture influenced Neumann in the development of his own work. During the latter half of the decade he worked for his former teacher Behrens in Germany, then again for Auguste Perret. After spending most of the Second World War hiding in Prague, and the last year of it at a concentration camp in Theresienstadt, Neumann settled in Brno to work at the Country Research and Planning Institute. There, he helped design urban plans for the Moravian-Silesian region of Czechoslovakia, which had suffered extensive damage from the wartime bombing campaigns. He presented this work at the CIAM VI meeting, on Reconstruction of the Cities, in Bridgewater, England in 1947. In 1949, Neumann moved to the newly formed State of Israel and taught architecture at the Technion-Israel Institute of Technology, and from 1953 to 1958 served as dean of the Faculty of Architecture and Town Planning. In 1959, Neumann formed an architectural practice in Tel Aviv with two of his former students, Zvi Hecker and Eldar Sharon. During the 1960s, their firm, Neumann-Hecker-Sharon, produced a highly inventive body of work that afforded architecture in Israel unprecedented international attention. During this time, their work appeared on the covers of the architecture magazines Domus, Architectural Design, The Architect & Building News, and RAIC Journal, among others. Rather than reproducing the generic International Style, Neumann inventively explored a new and radically different approach to architecture. For his ‘alternative Modernism’, Neumann deployed patterns – not only as a two-dimensional visual expression – but also as a three-dimensional organizational tool to dictate the logic of architectural space. As such, his buildings are composed of small individual units accreted (or, as Neumann called it, space packed) together to form larger patterns of space. Further, these patterns were scaled to the human body according to his EM-PHI system, also known as ‘the humanization of space,’ a comprehensive proportion theory that posited fundamental principles on the relation between architectural space and the human body. 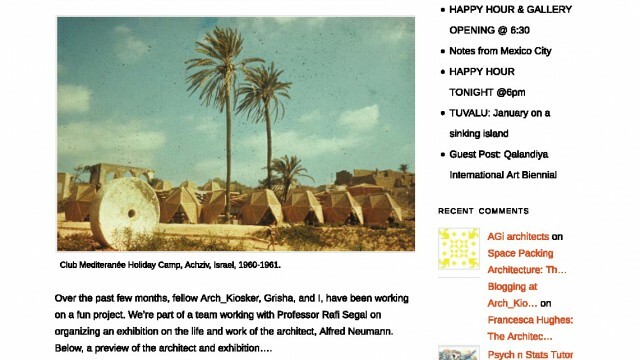 Neumann’s growing reputation in Israel landed him and Hecker (Sharon had since transferred over to his father’s firm) a large commission with the Technion. In 1963, they began to design new buildings for the university’s Faculty of Mechanical Engineering at their new Haifa campus. 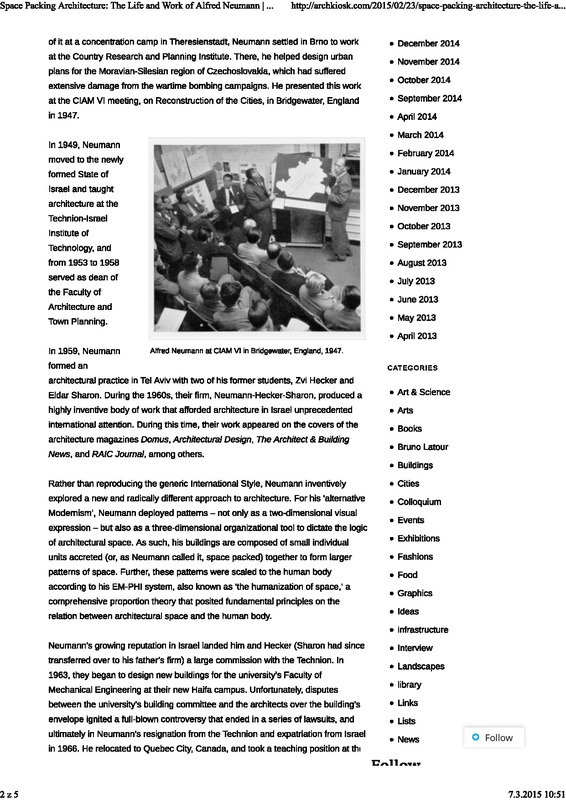 Unfortunately, disputes between the university’s building committee and the architects over the building’s envelope ignited a full-blown controversy that ended in a series of lawsuits, and ultimately in Neumann’s resignation from the Technion and expatriation from Israel in 1966. He relocated to Quebec City, Canada, and took a teaching position at the Université de Laval where he established a graduate architecture program. Two years later, he suffered from lung cancer and passed away. 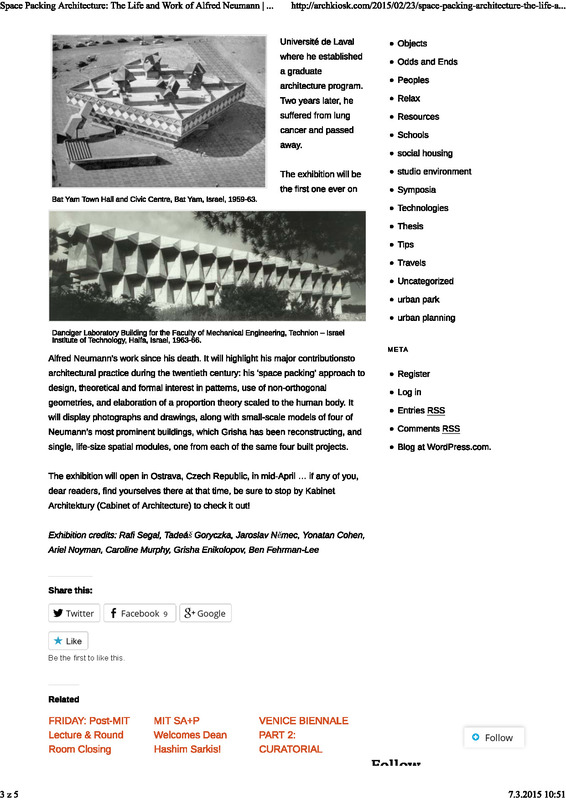 to architectural practice during the twentieth century: his ‘space packing’ approach to design, theoretical and formal interest in patterns, use of non-orthogonal geometries, and elaboration of a proportion theory scaled to the human body. It will display photographs and drawings, along with small-scale models of four of Neumann’s most prominent buildings, which Grisha has been reconstructing, and single, life-size spatial modules, one from each of the same four built projects. The exhibition will open in Ostrava, Czech Republic, in mid-April … if any of you, dear readers, find yourselves there at that time, be sure to stop by Kabinet Architektury (Cabinet of Architecture) to check it out!